Photos into Raw Teary-Eyed Emotion." will be envious of...even if you have never scrapped before. "500 Scrapbooking Sketches - affectionately known as my Bible"
"I am one of those scrapbookers who can never seem to get started on a layout. I push paper and embellishments around for hours and still have no success, but since I got my copy of 500 Scrapbooking Sketches (affectionately known as my Bible) I have been completing pages in no time! I've even had to buy a new album because I've filled my other albums! Thank you so much!" When you've ever wanted to easily create jaw-dropping scrapbook pages in less time than it takes to brew a cup of tea (transforming all those precious photos and recording your treasured memories)...while saving time and expressing your personality...then this will be the most important message you ever read. My name is Jennifer Gormly and until 2004, I was your basic scrapbook novice. I was an emotional basket case. One day I would have Van Gogh inspirations and creativity. And the next I couldn't decide which box of photos to start on. I swear I have sat many heart-wrenching hours swearing to myself . . . "I was going to finish 'at least' one page before hubby gets home". Doesn't it drive you nuts? I had nothing to show for all my efforts, even after months of working regularly. There was no way to know how each session would end. And it wasn't for trying, lord knows I tried, I just didn't know where to start. I had too many options and nothing ever seemed to fit right. Fortunately I'm The Kind of Woman Who Never Gives Up . . . Just Ask My Husband! This is when I discovered the 'real-life' secrets to producing eye-popping designs. And my scrapbooking life changed forever after just a few short days of trying these new secrets. . . Them “How I Did It”! And it just keeps getting better and better! My endless trail of pictures has become manageable...and I became “super woman like” to my fellow scrapbookers as if I have special creative powers. It's not magic at all! What I discovered had nothing to do with my ability to be creative or knowing where to start. . . and everything to do with these little insider scrapbooking secrets I discovered. These secrets involved using “Scrapbooking Sketches” I luckily uncovered this shortly after I got started back in 2004. Back then, I was looking to socialize with other family-oriented women who wanted to share their every day stories with supportive friends, swap ideas and have some fun. Trust me I know what it feels like to stare aimlessly at a blank page for hours. In fact, I used to get so frustrated and upset when I would go scrapbooking with my sister-in-law, because by the time I would get one page almost finished (if I was lucky to get one completed) she would already have 5 or even 6 beautiful pages put together. I keep wondering how this was possible. Maybe I lacked the creativity gene needed to produce work you would be proud to show your family. Imagine how this felt - showing up week after week - with only half-finished pages. I think my family was starting to feel sorry for me. I'm sure they thought I was wasting my time and should throw in the towel and quit. I have to confess to you - I was no longer a slave to the creativity “monster” - I will explain how all this works later – how I was able to come up with stunning page designs, while expressing my unique personality. Yet it was never stressful...easy to get started and so much more enjoyable. The overlooked and often forgotten technique of using Scrapbooking Sketches is so simple, yet so effective, that anyone – anyone -- can use it to instantly transform dull-blank pages into fabulous masterpieces exploding with colour, gorgeous patterns, stunning embellishments and what ever else your imagination can dream of. 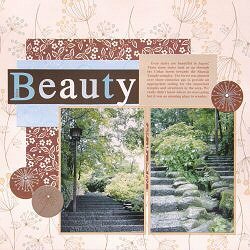 Using only your precious photos and your favourite scrapbooking supplies. . .you'll have all the other women drooling over your latest creations. How can this simple secret do all this for you? Easy. . . because this secret. . .
YOU Sit Down to Start Scrapbooking! Anyway, there's a good reason I'm telling you all this. You see, since 2004 the only way to begin using these amazing Scrapbooking Sketches was if you were to somehow stumble upon the free sketches I had been publishing online. These designs were small and hard to see, let alone figure out how to use them properly. Plus nothing was organized, meaning if you wanted to create a page with more than one photo, you had to search through the entire archive . . . basically eating up your entire scrapbooking time. Here's how a sketch works: A sketch is basically a plan or outline to help you get started and give you an overview of your entire project. It allows you to see how your photos will be arranged and how the different elements of your page mesh together before you even start scrapping. By using sketches you will be able to “test drive” your design deciding whether you like it before you crop a single photo allowing you to . . .
As you more than likely already know, the biggest time wasters for scrappers includes indecision and procrastination. However, the minute you apply a sketch, you’ve already passed up these two monsters and your battle is half way over. With a quick glance you'll know exactly how everything will look and flow so you just “fill-in-the-blanks”. Discover how to sift through the sketch collection and find just the right sketch for each and every project. Discover how to transform any sketch using only your personal style and flair into a creation leaving a statement about you. Spend more time expressing yourself, rather than wasting your creative energy deciding where to start putting each element on the page. Easily get ideas and inspiration whenever you need it and start creating page after page without procrastination. Stop searching for a design that inspired you last week. Every sketch is organized allowing you to find it any time you need it. Discover how to easily change and personalize a sketch to suit you. Discover how the same sketch can be used over and over by simply changing your photos and the scrapbooking supplies you use. (No two pages will be alike). No matter whether you are a traditional or a digital scrapbooker, you can start using these designs straight away. These scrapbooking sketches were made for square layouts of any size including 12 x12, 8 x 8 and 6 x 6, giving you the flexibility to use them for any project you want. Attention: No special skills are required to begin using these sketches properly. Even if you are a complete newcomer to scrapbooking you can produce the same quality of pages as women with many years of experience. Anyone can start using these sketches immediately, even if you have never created a page before. Plus: With a special segment of “Secret Instructions”, you'll get to see how experienced scrapper's take any single-page layout and morph it into a killer double page format. . . and how you can easily do the same. And there's more: You get my personal guide on how to make the most of your scrapbooking time so that you get more done more quickly and enrich your life through the joys of scrapbooking. Plus You also get a Free downloadable book to crank up your creativity and guide you along to creating memorable gift cards. 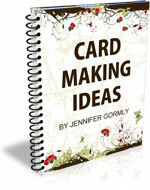 This snippet from my “Card Making Classroom” contains 7 easy-to-follow recipes for creating impressive cards. Just follow along, add a splash of your personality if you like, and let your inner child come out to play. And you get a collection of 60 Christmas quotes specially collated and chosen with scrapbookers in mind. They include everything from the reflective tones of Charles Dickens to the playful silliness of Dr. Seuss so you will have something suitable for any Christmas project. Can a simple sketch like this make that kind of difference in your scrapbooking? "I'm whizzing through my photo's . . ."
“Hi, I have enjoyed my scrapbooking sketches so much, I have completed so many pages over the weekend I astounded myself. It has been the best tool that I have bought since taking up scrapping. "I printed them out and placed them in a book . . . extra inspiration!" "My creative juices are back and flowing . . ."
"YOU took the work out for me." “My apologies for not taking the time to thank you for the best book I have ever purchased - but I have been busy scrapping thanks to your sketches. "I'd be lost without it!!!" Are these scrapper's any different than you? They represent women from all walks of life who share the same passion for scrapbooking as you do. The only the difference between them and you . . . they put their doubt aside . . . and gave these sketches a try. For them this book was worth it's weight in gold—and was worth every penny. If you too can put your doubt aside for a short time, you can see for yourself just what its like to create page after page without wanting to stop . . . get compliments on your work . . . and preserve every one of your family's precious moments so fast . . . you will have time left over to pamper yourself! A lot of women all over the world are going to be furious with me for sharing this “secret weapon” with you...especially after wondering why they can't create pages like yours. Oh – it won't take long for you to start using these simple ideas. What an impact you will have on others. Most women are set in their ways, with too much how they “think” you and I should be scrapbooking. YOU are not such a person. Besides – if you have stayed with me this far, you aren't like other scrappers anyway. Reserve your copy of my “500 Scrapbooking Sketches” downloadable book right now and instead of the usual investment of $49.77 - when you act fast and reserve one of the special introductory copies YOU will save an extra $21 and get it all for just . . . $28.77! NOTE: This special may not last past the next few days. Once the introductory special price period is over (which could be in a few days, a week or even today) I may raise your investment to $49.77 - which is still an absolute bargain, however I do not want you to miss out on the introductory special. 3 FREE Bonus gifts valued at $74, as my way of saying thank you in advance for becoming a valued customer. Learn how to fit more scrapbooking time into your busy schedule so you can rejuvenate your spirit and celebrate your life. Discover why having a creative outlet like scrapbooking is important to your well being and the positive impact it can have on your life. Discover the single most effective technique for saving time and avoiding headaches while scrapbooking. Learn 6 easy to implement methods that help you stay organised and on track. (You'll be amazed at how stress-free you will be and how much more you will get done). Learn 3 strategies to help you plan ahead and be confident with your choices. Stop procrastinating and create more pages more quickly. Find out how to make the most of your scrapbooking time, even if you only have five minutes to spare. Learn what products are available to help you finish your layouts more quickly while still being creative and having fun. Learn how to maximise the space on your layouts and move through your photos more quickly. Discover 4 quick alternatives to matting your photos so they will still stand out on your page. Discover 4 techniques that offer shortcuts to creating spectacular effects without all the hard work. Find out 5 ways to make your journaling quicker and easier so you can capture your thoughts and feelings with ease. 7 customizable unique designs. Takes the stress out of where to start. Directions are just like a food recipe. Grab the right ingredients, cut, crop, and paste for a special memento. Illustrate your own personality. These cards will be the most treasured by those who receive them. 3 personalizable sketches – now you can have a card for any occasion within a few minutes. You will never have to complete more that 8 simple steps for any card design. This will save you time and money. 60 different Christmas quotes especially chosen with you, the scrapbooker in mind. (Did you ever spend hours pulling your hair out trying to dig through quote directories in search of a quote only to find none of them really suited your layout?). You will never have to stress about trying to find the right words for journaling on your Christmas layouts again. When words escape you, use one of these quotes to express your thoughts. They will save you time and headaches. Fun, playful quotes capture the joy of this special time of year. Just the thing for photos of your kids putting out their stockings, unwrapping presents and writing wish lists to Santa Claus. Thoughtful reflections on the true magic of Christmas and the meaning it holds for you. Perfect for those family moments when everyone comes together in the spirit of giving and love. All the hard work has been done for you. Keep them on hand for your Christmas projects and you'll be amazed at how much time and energy you will save. This price wouldn't buy the basics you need to get started – let alone the personal satisfaction and pride the many women using these sketches are already experiencing. Yet, for the price of a few of cups of coffee at your local starbucks . . . you can create jaw-dropping pages for yourself . . . with these sketches revealing to you everything you would discover with endless hours of online searching. This, my scrapbooking friend, is the bargain of a lifetime for serious scrappers like yourself. What's more, your small investment is actually irrelevant, because. . . Here's how it works: I personally guarantee you will be 100% satisfied with your investment in 500 Scrapbooking Sketches or I will refund 100% of your money. As soon as you get these sketches in your hands I urge you to print them out and select a few designs you absolutely love. Grab all your materials and create a few magical pages. Take note of how fast you get the first two pages finished and lookin' good. At the end of 60 days or anytime before if you're not 100% convinced you can begin producing page after amazing page with almost NO effort. . . I want you to get your money back. No questions asked. No hassle. Heck, even if you get too busy. . . or for no reason at all I will promptly refund your investment in full and all the free bonus gifts are yours to keep as an apology for wasting your valuable time. No fine lines. Could I be any more honest and upfront? You be the judge, (not me) and decide if you're ready to start creating magazine quality pages with almost zero effort overnight. Invest in your discounted copy of “Scrapbooking Sketches” right now. The Ball is Now in Your Court . . . I have done everything I can do to prove to you just how amazing and informative my Scrapbooking Sketches book will be for you. The ball is in your court, if you want to double fault and continue struggling to produce pages you are proud of . . . then do not invest. If on the other hand, you want to serve an ace and create awe-inspiring scrapbooking pages with very little effort, blowing away anyone who lays an eye on them . . . then take immediate action right now, while it's fresh in your mind . . . today and make an impact on your family's most important heirloom. Wishing you many years of rewarding Scrapbooking. P.S. HURRY! 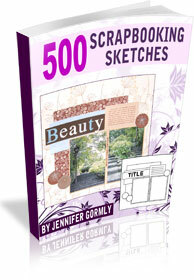 This is the special introductory price for Scrapbooking Sketches. Once the introductory special price period is over (which could be in a few days, a week or even today) I may raise your investment to $49.77 . . . which is still an absolute bargain, however I do not want you to miss out on the introductory price OR the 3 FREE Special Scrapbooking Bonus Gifts valued at $74. These 3 FREE Bonus Gifts will not always be available. To ensure you lock in your special, one time low investment and qualify for YOUR 3 FREE bonus gifts . . . valued at $74 -simply download right now! P.P.S. Don't forget you have a full 60-days to evaluate every one of the 500 sketches inside this manual. You could be a long way towards catching up with your photos before the end of the guarantee. When you do . . . I would love to hear how they turned out! Click here to invest in the Scrapbooking Secrets!